Clipping your dog’s nails is an important part of keeping your dog healthy. Trimmed nails are imperative for proper posture and allows a dog to feel more stabilized when walking and running. When dogs have long nails they tend to stand a little back on their feet. This type of poor posture becomes hard on the joints making walking and running more difficult. Nail beds will also get sore from jamming into the ground. In addition, elderly dogs with health issues such as arthritis may have particular difficulty, and increased pain. You may have heard, or wondered why, it is recommended to get a puppy used to having their paws handled. One of the reasons is to help make nail clipping easier later on. Most puppies will automatically pull away or nip at your hand if you try holding their paws. But it’s important for them to get used to their paws being handled at an early age so in adulthood they don’t bite every time they are touched in places they don’t care to be. Not only will the paws need to be handled for nail clipping, but there are other reasons such as for grooming or attending to an injured paw. When is it Time for a Nail Trim? And What is the Quick? Any vet or groomer can trim your dog’s nails, but with a little patience and practice you can also learn to handle this at home. Many owners are fearful of clipping their dog’s nails because of the quick, which is the blood supply and nerve that nourishes the nail. 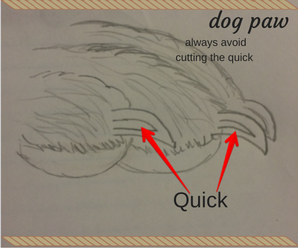 When the quick is accidentally clipped it will cause bleeding and discomfort to your dog. But, even the most experienced groomers, and vets, accidentally cut a quick from time to time. You’ll need to know how to trim the nails, and what to do should you mistakenly cut into the quick. When you hear your dog’s nails tap, tap, tapping on the floor as they walk, you know it is time for a trim. The best length for your dog’s nails is a length where they don’t touch the ground when standing. If you allow the nails to grow too long, the bad part is that the quick will also grow longer right along with the nail. This makes it difficult to clip the nails to a healthy, short length as the quick will be in the way. In this case, many nail trimming sessions will be needed where the nails are trimmed as close to the quick as possible. Only then will the quick begin to gradually recede back to a normal length. If you’re not comfortable trimming so closely to the quick, you may need the help of someone more experienced in order to get to this point. After that, be sure to trim your dog’s nails on a regular schedule to ensure they don’t get too long again! Dog’s nails grow at different paces depending on many different factors such as breed, diet, or the surfaces they walk on. A dog’s nails may naturally be filed down in they are very active and continually walk on hard surfaces such as asphalt and concrete. The best thing to do is stay calm, and move on…that is, after using your styptic powder. If you haven’t yet heard of styptic powder, it is a powder made specifically for stopping bleeding due to minor cuts, such as cutting a quick. It is the quickest, most effective, method to clot the blood. To use it, there is no need to wipe the blood away first, just simply take a pinch of the powder and press it into your dog’s nail. Do not get upset, apologize to your dog, feel sorry for him, or make a big fuss out of it or your dog will begin to feel anxious. Remember, you need to make this a positive experience. A home remedy, should you not have styptic powder on hand, is cornstarch or flour. Although, I hear that styptic powder tends to work a bit quicker so I’ve always opted for that method. Some people prefer to clip their dog’s nails on one paw each day or even one individual nail each day, in order to keep nail trimming sessions short and quick. You can leave it up to your dog…by seeing how he reacts to nail clipping sessions you can use your best judgement from there. There are two types of dog nail clippers, a scissor style, and a guillotine style. The scissor style nail clippers look, and act, much like a regular pair of scissors, with some differences in order to be suited for nail clipping, of course. With the guillotine style, the nail is inserted into the metal hole in the clipper, and once you squeeze the handles of the clipper together, a blade slides across the hole to trim the nail. Some people clip their dog’s nails and then use a dremel to get as close to the quick as possible, and also to get rid of sharp edges. Or, some people use only the dremel and skip the nail clipper altogether. A dremel will grind the nail down at a slow pace so you have better control as to how short you make the nail. A downside to using a dremel is that some dogs may be afraid of it since it makes noise, and there is also a vibrating sensation when placed against the nail. In addition, you do have to be careful as it can hurt a dog’s face if he gets near it. I’m not, by any means, trying to steer you away from using a dremel though because for a dog who tolerates it well (and many do) it can be a great tool. If you do decide on a dremel you should always stop at the point when the tip of the nail seems a bit softer and you don’t see as much dust flying off the nail. This means you have reached the fleshy part before the quick begins. Always stop if your dog shows sensitivity as this is the best indicator that the nail is complete. Be sure to use a nail trimmer of good quality. You don’t want the blade to be so dull that you have trouble clipping as this may be uncomfortable for your dog. If you have a dog with very furry paws you can try slipping the paw through a nylon stocking to hold the fur back and out of the way. Make sure your dog is calm and comfortable. 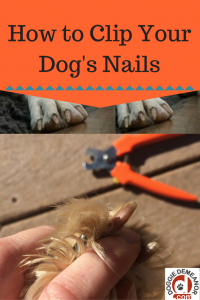 Do what you can to associate clipping your dog’s nails with a pleasant experience. That way your dog won’t mind doing it again and again. 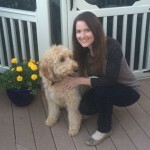 Talk to your dog, offer pets and pats, treats, etc. Hold your dog’s paw in your hand and gently use your fingers to separate the toes. You may find it easiest to lay your dog on his back, with his head closest to you, since this places his paws in the air and more readily accessible. In addition, he won’t be able to see what you are doing. However, many dogs won’t go for this and that is fine too…whatever works for you is fine. You want to take a close look at the nail and clip at the part where the nail begins to curve down toward the floor. If you have a dog with white claws, from the underside you will see what looks like a little pink horseshoe inside the nail. This is the quick which you do NOT want to clip. For a dog with dark, or black, claws it is a little trickier since you can’t actually see the quick through the nail. For dark colored nails, holding your dog’s paw firmly, clip just a little bit of the nail at a time to ensure you don’t clip the quick. Keep checking, and when you start to see an oval-like figure on the surface of where you’ve been clipping, that means you are nearing the quick and should stop. Give your dog lots of praise once complete!